The first time I had a French macaron was on my first visit to Paris, France at the famous and breathtakingly beautiful Ladurée Bakery. 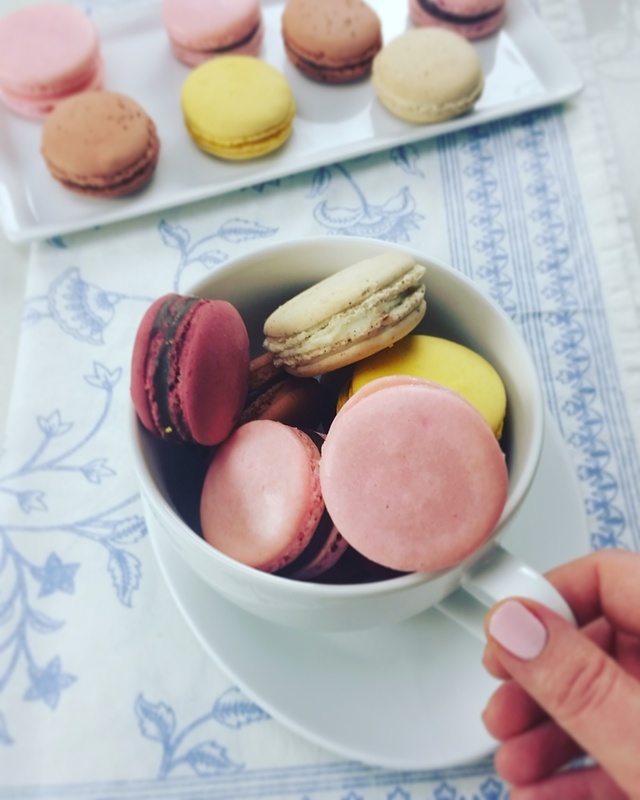 Up to this point, still in my early 20s, the only macaron I have experienced was actually the coconut macaroons I’d eat for Passover. And I must admit, I wasn’t expecting much more from the French macarons as I did from the chewy, overly sweet coconut concoctions. Boy, was I wrong! As I fell in love with France, I fell in love with these almond meringue cookies that ranged in color from the softest Easter pastels to the deepest and brightest jewel tones. With a crispy skin on the outside, the cookies are soft and tender and slightly chewy as you bite into them and discover the flavor of the butter cream or chocolate ganache that holds them together. Eating just once is too difficult. You want to get a selection of several and savor them on their own. Skip the coffee. 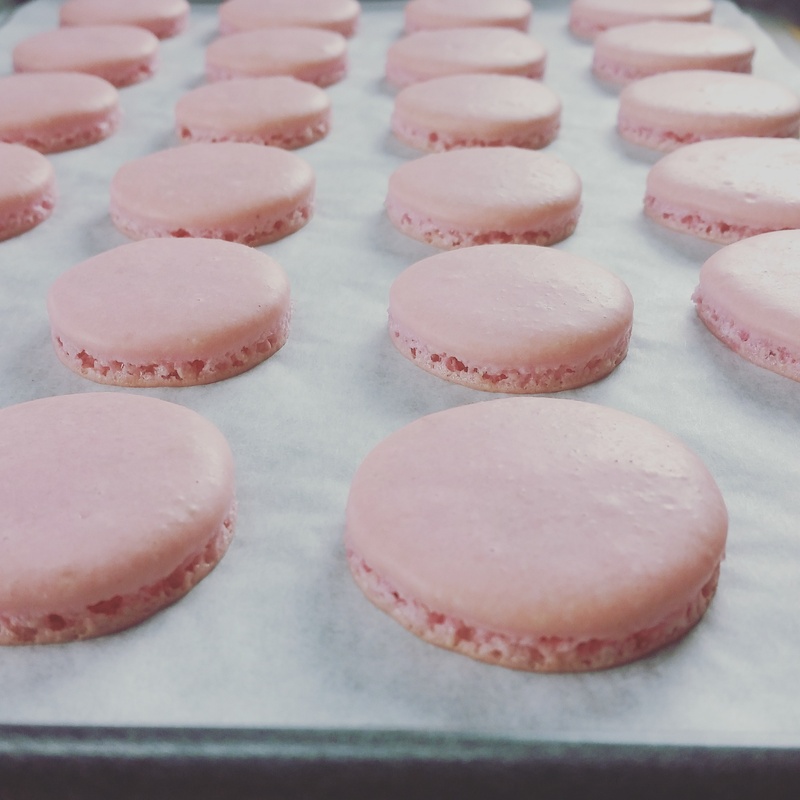 A decade has flown by in front of my eyes, and I have enjoyed plenty of macarons during that time. From another Ladurée Bakery in Italy and from one of my favorite bakeries in Seattle, Bakery Nouveau. 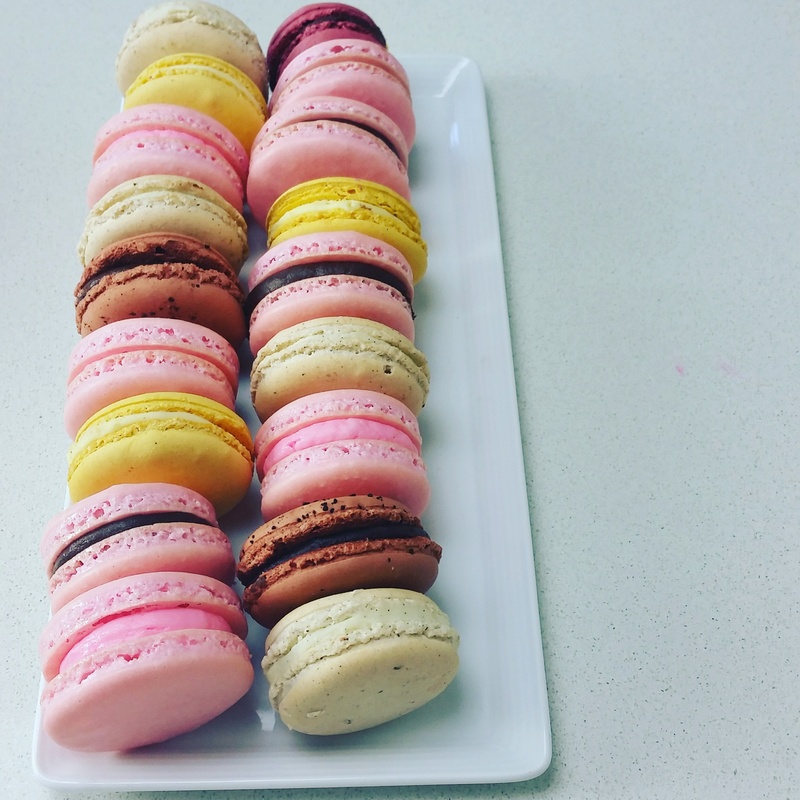 But it wasn’t until last week that I baked French macarons on my own (I don’t even remember baking them while studying culinary arts at The Culinary Institute of America). The opportunity presented itself at work, and I rose up to the challenge. As I’ve mentioned in my previous posts, trying out new recipes and techniques is one of the things that I love and appreciate the most about my job as a Food Stylist and Editor at allrecipes.com. You guys! These little things are tricky business! Finicky, super time sensitive and require a lot of patience and attention to detail (think measuring all ingredients up to a gram!). This kitchen experiment will require you to step up, buckle in, and perhaps even say a prayer or two. 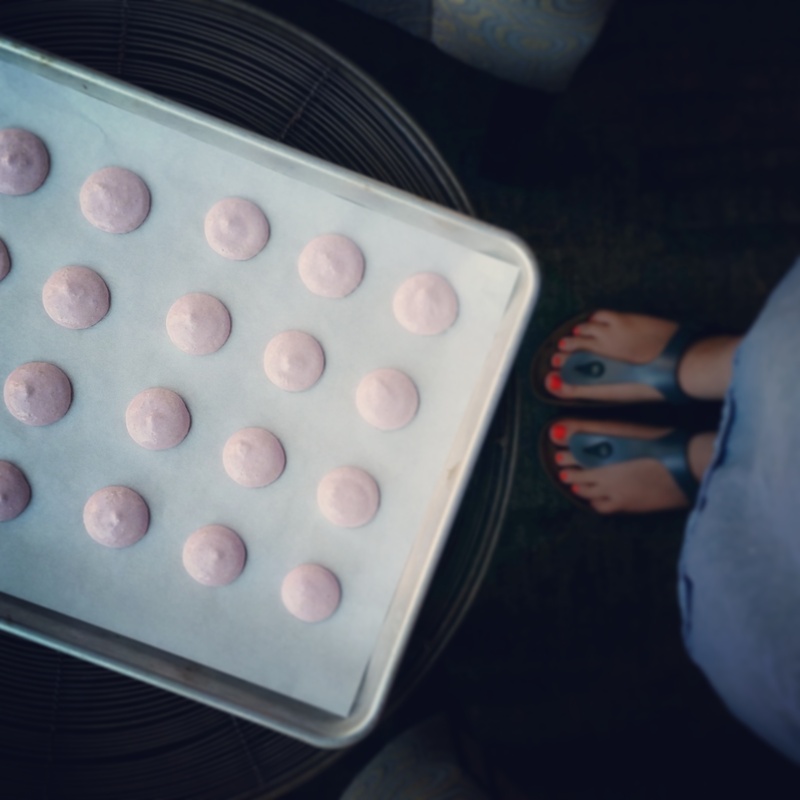 I know, I’ve said my share of prayers to the Macaron Goddess to ensure that my macarons bake up evenly, with beautiful, tall feet, and smooth, shiny tops. With the 5 batches of the same recipe, some turned out better than the others. Thanks to my friends and family for encouragement along the way and readily consumption of the baked goods. Above is a photo of what my kitchen at home looked like when I tested the recipe. I colored the cookies almost a black currant color and sandwiched them with chocolate ganache flavored with pomegranate liqueur. These got served for a Rosh Hashanah celebration (the Jewish New Year) to add sweetness to the year ahead! 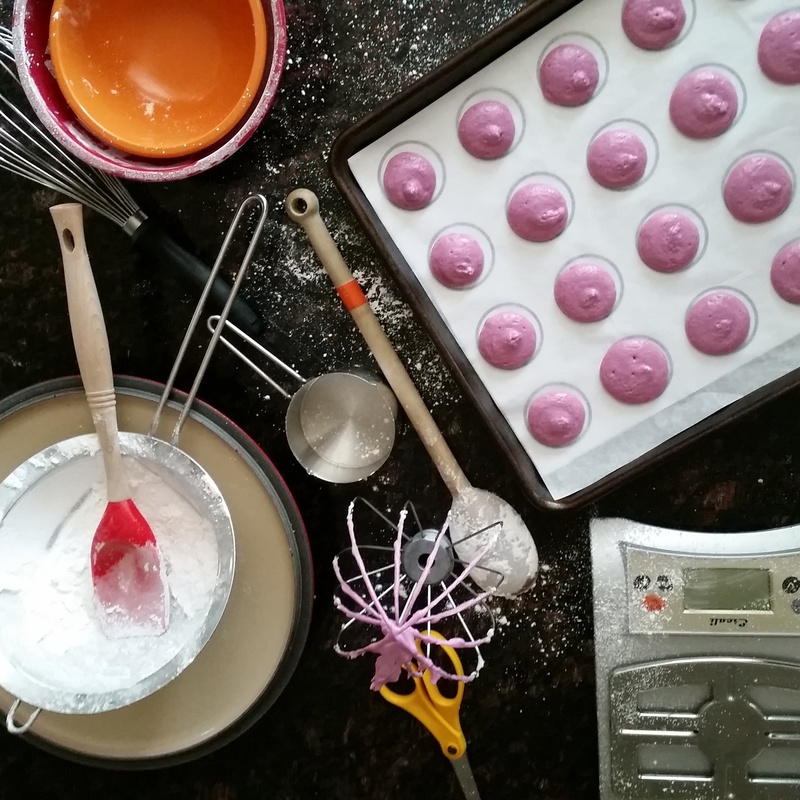 If you are a fan of baking, new challenges, and delicious, French sweets, do give this project a try. There are plenty of recipes out there, ranging in ratios of almond flour and sugar, baking temperature and times. I encourage you to try a few and find the one that best suits your preferences. Enjoy!